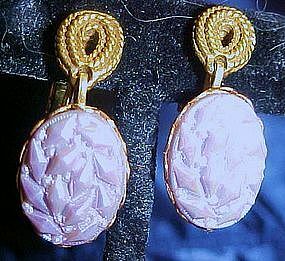 Pretty earrings in gold tone with oval formed glass oval sets. Gold rope acccents at the top, The lavender glass stones have a lustre finish. The oval stone measures 1/2" x 3/4". Excellent condition. Marked Goldette. Clip backs with screw backs for a better comfort adjustment.